During the Period of nearly a quarter of a century Henri Appy as been preeminently the most distinguished musician in Rochester in fact there are hut few, if any, in America whose fame is so wide-spread throughout the world. 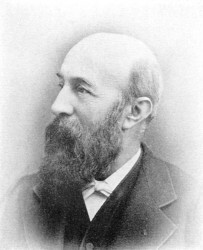 Professor Appy, the oldest of a large lamily, was born at the Hague in 1830. His father, Jean Appy, an eminent violinist, was a pupil of Rhode and conductor of the Chapel of the King of Holland. Henri was born in a musical atmosphere and inherited a love for classical music that was nurtured by his surroundings. He began his musical studies under his father when but fIve years old, and at the age of eight entered the Royal conservatory under the charge of William Lubeck, solo violinist to the Court of Hanover. Here he made such progress that when twelve years old he took first honors over all competitors. Next he studied under the violinist Berzieou, and then was sent to study under Savari, a pupil of Paginini. His father died at this time and Henri became the main support of his mother and her younger children. He was then such a master of the violin that the concert halls where he played were crowded to hear him and his reputation had spread so wide that he was led to make a concert tour of Holland and Germany. The success of his tour was so pronounced that on his return to Amsterdam he was invited to play before the King at Felix Meritus, of which Van Bru was director. Henri, on the occasion, played by request, Mendelssohn's violin concerto and with such effect that the King personally presented to him the decoration of honor. The American consul to The Hague, Mr. Schwartz, was present and advised the young artist to make a tour of America. The advice was followed and he made his first public appearance at Niblo's before a large and critical audience, who were captivated by his skill. He next played with the Philharmonic Society of New York, repeating his previous success. This led to an engagement with Jenny Lind, at whose concerts he was solo violinist. He was then induced to make a tour of the chief cities of the United States and was assisted by the most eminent artists. He played with Madame Sontag, Madame Le Baronesse de Berg, Gottschalk, Gustave Satter, Richard Hoffman and others. Catharine Hays, Emma Bostwick and Paradi were among his prima donna assistants. After a triumphant tour of the principal cities Professor Appy was invited to locate in Cincinnati, and gave a series of concerts there which are credited with planting in that city the taste for classical music which it still retains. The climate of Cincinnati did not agree with him and he came back to New York, from which city he was invited to Rochester to become Director of the Academy of Music then in existence. Soon after his arrival here he organized the Rochester Philharmonic society and was its director for twenty years. With the lapse of years Professor Appy became tired of public life and of late devotes his time mainly to giving private lessons. His success as a teacher has been no less marked than as a performer in public, and his pupils, to whom, in many cases, he seems to have imparted some of his own genius, are perpetuating his fame all over his adopted country. 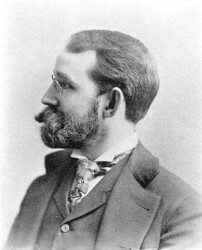 Professor Hibbard E. Leach, one of the first of Rochester's music teachers, was born in Livingston county February 16, 1852. His father, Ebenezer Leach, was for many years a piano dealer in Rochester. Mr. Leach studied his profession both here and abroad and began his career as a teacher in this city twenty years ago. For ten years of that period he taught both voice and piano in Miss Bliss' school; since then he has devoted himself to the teaching of vocal pupils exclusively. But he has not allowed his talents as a pianist and organist to fall into disuse. During his stay in this city he has been successively organist at the First Baptist, First Presbyterian and St. Peter's churches, and he still holds the last named position. Eighteen years ago Mr. Leach married Evelyn Wayte, daughter of Edwin Wayte, one of the founders of the Lake Avenue Baptist church. He has two children, a son and a daughter, and now resides on Brighton avenue. Mr. Leach has reached his present position in Rochester musical circles by no sudden leap. It has been acquired by steady and faithful application to the best interests of his pupils. These now number the majority of the best local singers and there is scarcely a church in the city in which one or more of his pupils are not engaged as soloists. Mr. Leach has always kept himself in the back-ground and thrust his pupils forward and the result of this policy is his present success. In only one way does his personal talent ever appear to the general public; it does not require attendance at more than one of his pupils' recitals to recognize in him an ideal accompanist. These recitals have come to be one of the principal musical events of the local season and the only difficulty experienced is to provide seats for one-half of those who desire to attend. Durir~g the last several seasons his pupils have rendered familiar by these recitals the best works of both the modern and the ancient composers. Mr. Leach and his pupils stand for what is best in vocal culture in the city of Rochester. The subject of this sketch was born in Newark, New Jersey, May 27, 1863. His father was Charles Boylan, eminent among the more prominent Masons of New Jersey, and a descendent of a long line of ancestors distinguished in public life, the great-grandfather of Charles Frederic having been a member of parliament from the North of Ireland. On his mother's side his family is no less noted; her maiden name was Ann Currie Clark, and her forefathers were among New Jersey's most prominent citizens. In circles where birth and ancestry are all-important considerations Professor Boylan might, were he so disposed, assert his title to distinction. After his father's death he went to Lima, New York, and was educated in the Genesee Wesleyan seminary. His musical studies were pursued under the direction of Professor George H. Bangs, who was professor of music at the seminary when it was universally recognized as one of the foremost music schools of America. He afterwards studied with the late Mrs. C. S. P. Cary for several years. In addition, and in order that nothing should be omitted that would conduce to the attainment of perfection in his chosen art, he studied under the most celebrated musicians of New York and Boston, including among them Carl Bearmann, who was formerly principal of the Munich Conservatory of Music, Germany, and who has the reputation among musicians of being one of the great teachers of the world, it is evident that Professor Boylan has had the advantage of the best American and European schools in all branches, including thoroughbass, harmony, theory, etc., and his success in this city is of itself sufficient to prove the fact. He came to Rochester in 1880 and has been among its foremost teachers in music ever since. He has demonstrated his ability as a teacher in more than one line of music, but has made the piano his specialty. His classes are among the largest, and his pupils are from the most discriminating members of the community. As a player Professor Boylan possesses many of the artistic characteristics of the professional concert-pianist and while his studies were pursued partly with a view to that end, by advice of his instructors, he found playing in public so distasteful to him that he abandoned the idea in favor of teaching. In addition to his proficiency as a pianist he is gifted with a high tenor voice, in the cultivation of which he has spent much time. At an early age his talent in this direction was so marked that it first suggested the idea of a musical education. His singing attracts an unusual degree of interest wherever heard and has shown certain characteristics which, like his playing, demonstrate the fact that his musical ability is of the highest order. The inheritor of a talent for music, which was cultivated at Leipzig, Charles E. Van Laer is naturally a leader of the profession in this part of the State, and his influence on the art in the city of his home has been most marked. Mr. Van Laer was born in Auburn, New York, where his father was a dealer in organs and pianos. At the age of ten years he was sent by his parents to a boarding school in Germany, where he passed four years in general study and took up music as an accomplishment in which he developed that talent so conspicuous in after years. On returning to America he engaged in the music business and devoted all possible time to study of music and musical instruments. In 1873 the bent of his inclination pointed to music as the pursuit of his life. His parents sent him to Germany to make a special study of music. He entered the Royal Conservatory of Music at Leipzig, where he took a three-years' course under Oscar Paul, Dr. Coccins, Weidenbach, E. F. Richter, Alfred Richter and S. Jadassohn. At the age of twenty-one Mr. Van Laer left the Conservatory a master of music in theory and practice. Before he returned to America he had several engagements as musical instructor in this State. In 1882 he came to Rochester and at once took rank as one of the leading musicians of this musical city. His success as a teacher of the piano and organ has been most satisfactory. Mr. Van Laer is author of several highly meritorious musical compositions. 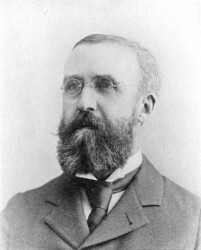 Few musicians in America have had such advantages for acquiring a mastery of their profession as were enjoyed by Wilhelm T. O. Pabst, director of the Mænnerchor-Liedertafel. He was born in 1858 at Altengeld, Thuringia, Germany, and at the age of six years began the study of the violin, piano and organ. Early in life he became organist of the Castle church of the Grand Duke of Mecklenburg, who, perceiving the talent of the young musician, undertook the care of his musical education and obtained for him such teachers as Frederick Kuecken, the world-renowned composer; Alois Schmitt, the leader of the Court orchestra at Schwerin; Antoine Trutschel, Otto Kabe, and Gustav Laska, the well-known virtuoso and composer. Under these eminent masters Mr. Pabst received the most thorough training on the piano, organ, violin and in vocal music; also in theory, composition, musical history and instrumentation. His first engagement on the close of his studies was as director of the orchestra at the Crystal palace in Liepzig. He was afterwards Orchestral and Choral Conductor in the cities of Narva and St. Petersburg and remained in Russia five years. On leaving Russia Mr. Pabst returned to Germany and settled for a time at Weimar, where he devoted his time to original compositions, which have been received with much favor in Germany and Russia. 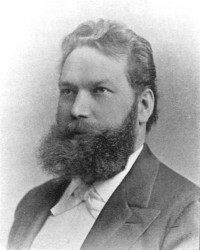 From Weimar Mr. Pabst came to Rochester by invitation of the Liedertafel to take the directorship of the society, and the present high standard of the Mænnerchor-Liedertafel is the result of his untiring work. His success in this city, both as a director and teacher has been most gratifying to his many friends. REV. NELSON MILLARD, D. D.
Nelson Millard is a native of Delhi, Delaware County, New York, in which place he was born October 2, 1834. He was educated at the Delaware academy and at Union college, from which latter institution he was graduated in 1853. After graduation he was tutor at Union for a period of four years, and subsequently was offered a full professorship in that institution. He attended Princeton and Union seminaries, graduating from the latter in 1860. Just after this date Dr. Millard passed a year and a half in Europe engaged in study. His first pastorate was at Montclair, New Jersey, where he remained five years, until 1867. From Montclair he went to Chicago to become pastor of a prominent church in that city. Later he accepted a call to a church in Peekskill, New York, where he remained two and a half years. From this charge he went to Syracuse over the First Presbyterian church, of which he was pastor for nearly twelve years. Dr. Millard's next pastorate was the Broadway Congregational church of Norwich, Connecticut, from which field of labor he came to the First Presbyterian church, Rochester. On special occasions Dr. Millard has preached, on invitation, before the faculty and studentsof Cornell university and of Auburn seminary, and also in Chicago. in 1869 Dr. Millard married Miss Alice I. Bond, of Montclair, New Jersey, a lady who has ever proved a most valuable and sympathetic helpmate to her husband in his life-work. As a pulpit orator Dr. Millard has an extended reputation, and his discourses are a delight to listen to. His church in Rochester is in a prosperous condition, a fact very largely due to its pastor's efficient work in connection therewith. Socially Dr. Millard is a delightful man to meet. His conversational powers are rare, while his qualities of mind and of heart are such as draw others to him. His home on Oxford street is one of the most attractive in the Flower city. REV. 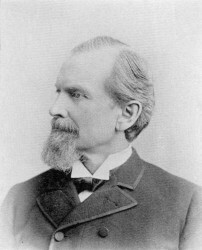 WILLIAM R. TAYLOR, D. D.
Rev. William R. Taylor, D. D., pastor of the Brick church, was born in Philadelphia, September 28, 1856. His paternal ancestors for five generations were ministers, and he decided at an early age to enter the ministry; with that purpose in view he became a student at Rutger college, of which his father, grandfather and great-grandfather had been trustees. He was graduated from Rutger in 1876 and entered the Theological seminary of the Reformed church in New Brunswick, New Jersey, where he studied for three years, at the termination of which he became pastor of the church at Franklin Park, New Jersey, and remained until 1884. 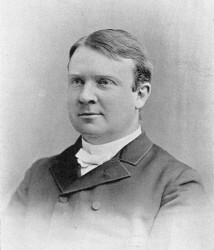 From 1884 until 1888 he was pastor of the First Reformed church of Philadelphia. On February 10, 1888, Dr. Taylor began his labors as pastor of the Brick church in this city. He is president of the New York State Conference of Christian Endeavor. Henry Hamlin Stebbins was born in New York city, June 3, 1839. In youth he attended an English and classical school of high standing in New York, and subsequently took up business, intending to devote his life to commercial pursuits, but soon abandoned this idea and entered Phillips academy, Andover, Massachusetts. In 1858 he entered the New York University, but a year later joined the Sophomore class of Yale college, from which institution he was graduated in 1862. From the latter year until 1865 he was a teacher at Irvington, New Jersey, but subsequently became a student at Union Theological seminary, later on entering Princeton seminary, graduating finally from both institutions. Dr. Stebbins's first pastorate was over the Riversdale Presbyterian church in a district now included in New York city. In January, 1874, he was installed pastor of Grace church, Oswego, in which city he was called upon to part, through death, with his wife Mrs. Stebbins was a most estimable lady, and her death was very deeply mourned by her husband and a large number of friends and relatives. Mrs. Stebbins was formerly Caroline S. Van Cott, of Brooklyn. In June, 1878, Dr. Stebbins married Miss Julia F. Allen, of Oswego, a lady of high social standing in that city. Dr. Stebbins's pastorate in Oswego lasted nearly fifteen years, and his work there was rich in results. In June, 1883, Hamilton college conferred on Mr. Stebbins the degree of Doctor of Divinity. In 1888, after declining a flattering call from the First Presbyterian church of Detroit, Dr. Stebbins accepted the invitation of the Central Presbyterian church of Rochester to become its pastor, and on Sunday, the eleventh of March, he officiated in that pulpit as pastor-elect. His pastorate in this city has been most successful, as is evinced in the growth of the church from eight hundred members to its present membership of nearly seventeen hundred, although during the six years he has been in Rochester there have been not far from thirteen hundred accessions. During this period a fine auditorium, costing $105,000 ($30,000 of this amount having been raised through the personal effort of the pastor) has been erected, the old church edifice having proved far inadequate for the purposes of the society. As a preacher Dr. Stebbins is both scholarly and practical. REV. CHARLES P. COIT, D. D.
Charles Pierpont Coit is a native of Hastings, Oswego county, New York, where he was born May 3, 1839. His parents were of New England birth, and prominent residents in the village of his nativity. Mr. Coit was prepared for college at Falley seminary in the village of Fulton, Oswego county, and entering the University of Rochester was graduated from that institution with the class of '67. 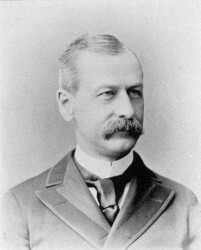 Entering Auburn Theological seminary on leaving college, Mr. Coit was graduated in 1870 and immediately began his ministerial career by organizing the North Presbyterian church of Binghamton, New York. As pastor of this church Mr. Coit remained for a period of four years and a half, doing a work which is very pleasantly remembered by the people of that charge. From Binghamton Mr. Coit was called to Baltimore, where he organized and became pastor of the Hampden Presbyterian church of that city. Here he remained beloved of his people until the twentieth of November, 1877, when he accepted a call to Memorial Presbyterian church of this city. The structure occupied by Memorial society at the time was only in the nature of a chapel, which the congregation soon outgrew, and in 1881 the society built a brick church of commodious size, but owing to the rapid growth of the parish, in 1892 the society reared an elegant church edifice on the site of its former house of worship, a structure valued at nearly or quite $75,000. The society of which Mr. Coit is pastor, while not so wealthy in a merely material sense, is wealthy in influence and spiritual power. 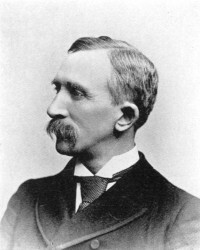 Mr. Coit's clerical labors in connection with Memorial church have proved from the very beginning of the highest character. His work has been close and far-reaching, and both in and outside of his parish he is recognized as one of the most able and spiritual-minded of the clergy of Rochester. It is not too much to say that devotion to each, on the part of the pastor and people, is a marked feature in the life of this growing parish, as is the devotion and love of both to the Master who is the head of the Church on earth. In 1874 Mr. Coit marrried Miss Susan H. Warner, of Owego, a lady who has proved a most valued co-worker with her husband in his ministry. They have three children, a daughter, a student at Wellesley college, and two sons, who are preparing for college. 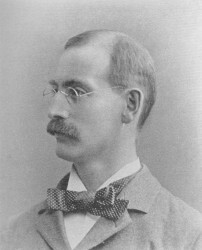 Dr. Coit's degree of Doctor of Divinity was received from Rochester University in 1892.